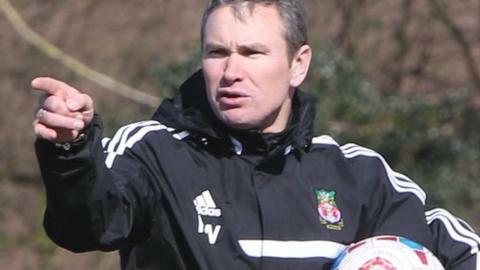 Wrexham boss Kevin Wilkin is planning a summer shake-up and admits some decisions will not be popular. Only five members of Wrexham's current squad are under contract for next season. The Dragons face Forest Green Rovers in their final game of the season on Saturday with Wilkin ready to ring the changes. "I've got to make decisions about people that may be in one or two quarters a bit unpopular," he said. "There's some players I have made my mind up on and there are several players that would fall into a bit of a grey area. "Everybody's had a fair chance and fair opportunities. "But I want to progress Wrexham football club and I want to get Wrexham football club back into the Football League. "It needs to be shaken up a little bit and that's what I have to do." Wilkin said talks with current squad members would begin towards the end of next week following Wrexham's final game of the season. The former Nuneaton Town manager will also be looking to add to his squad during the close season. "I'll obviously be speaking with players that I'm going to try and bring in and continue to work on that," Wilkin added. "While the games have obviously finished for me as a manager I want to be out there and try and bring people in. "It's a very busy period, trying to get people on board to get us moving forward." Wilkin was disappointed with his side's performance in Easter Monday's 1-0 home defeat against Lincoln City but hopes to end the Conference Premier season on a high away to Forest Green. "It wasn't an acceptable performance. It didn't look like the effort levels were there that we would all expect," Wilkin added. "I don't think for one moment players go out not to try but we allowed the game to move away from us after about 15 minutes and it became difficult. "I was disappointed with it and have had to dust myself down as have the players and it's important we go to Forest Green in the right frame of mind, look to address that and finish on a high."